There hasn’t been much Android 2.2 for the Droid Incredible talk in recent weeks, so we thought we’d fire up that engine again with a juicy rumor that just hit our inbox. 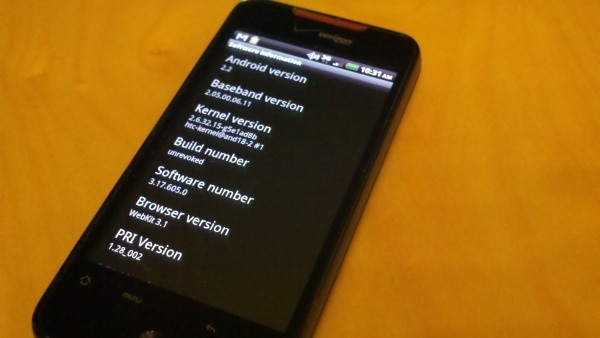 The Droid and Droid 2 already have the latest Android OS leaving those with the Incredible and Droid X feeling just slightly frustrated. So when can we expect it then? According to one of our sources, the DI’s update to Froyo should happen on September 1st and will include all of the previous features we’ve covered a dozen or so times such as 720p video, improved voice quality, and a bunch of bloatware. Apparently the marketing team for Verizon has already been notified and you can expect to see a ramp-up of DI commercials over the next week or so. Update: Our sources are now backing off of their original report. Delays people. No word on what those may be, but the 1st is likely out. And that was the quickest rumor in Droid history. We’re sorry that we’ve wasted you time. I hate Froyo. Start crossing your fingers now. And as we’ve clearly stated in the title, this is only a rumor until we see some documentation or until an update actually hits someone’s device. Until then, we’ll keep digging as we always do for further confirmation. Of course you can also root your phone and install the leaked 2.2 now.